Meryl Streep is a chameleon, so I wasn't surprised to see her slip into a wanna-be rockstar persona as easy as any of the other roles she has played, from the witch in Into the Woods to the family matron in August: Osage County. Streep gives a fantastic performance in this film as Ricki Rendazzo, real name Linda Brummel, who moves from Indianapolis to L.A. to pursue her dreams - but in the process, leaves her family behind. 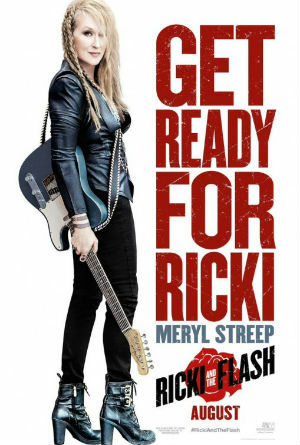 Ricki (Streep) lives in a tiny apartment in L.A., but has a regular gig with her band, The Flash, at a local bar. She works full-time at Total Foods (think Whole Foods) so that she can pay her bills. When she gets a phone call from an Indianapolis number one day at work, she knows something is wrong, and indeed it is: Julie (Mamie Gummer), her daughter, has just been left by her new husband, who cheated on her. Ricki scrounges up the money for a plane ticket home, to find her ex-husband (Kevin Kline) living in a huge new home with his wife, Maureen (Audra McDonald), though she's in Seattle caring for her father, who has ALS. Ricki also must make peace with her two sons (Sebastian Stan, Hayse Jack), one of whom is still bitter that she left them all those years ago. Mamie Gummer is Streep's real-life daughter, and you can tell: they're almost lookalikes. The two stars of this show, however, are Streep, who stole every scene she was in, as well as Rick Springfield (yes, THAT Rick Springfield) as the lead guitarist in her band and also her boyfriend, who loves her but understands she's "gun-shy" about love. Also underused here was Ben Platt (Pitch Perfect) as a young bartender who worships Ricki and her singing. Yes, see this movie, but save it for a matinee. It's light on plot but makes up for it with the performances (who knew Streep could sing like that?!) and great acting throughout. The film was written by Diablo Cody (Juno), who has said that Streep's character was based on her mother-in-law, who plays in a bar band in New Jersey, and Streep definitely rocked the role (no pun intended). Kevin Kline, Audra McDonald, and Sebastian Stan were also good as Streep's ex-husband, his new(-ish) wife, and Streep's son, respectively. This isn't a movie that you'll think about for a long time after leaving the theater, but it's a fun one to see, and one that is definitely entertaining. Ricki and the Flash is in theaters today, August 7th, and is rated PG-13 with a runtime of 102 minutes. 3.5 stars out of 5.